If we can spot a cancer in its early stages it’s often far easier to treat. More than half of cancers are diagnosed at these early stages, so now our research in Cambridge is trying to detect the others. One way of spotting tumours or early signs of cancer, particularly for oesophageal cancer, is to place miniature cameras inside the body and look around for signs of disease. This is called an endoscopy. But inside our bodies, most of the surfaces and tissues appear pink. And the same is often true of cancer. If only a tumour were a vivid green, our challenge would be an easy one. Unfortunately, this is not the case – tumours can sometimes appear ‘invisible’ on camera as they blend in to their healthy surroundings. But not if we can see beyond our standard colour vision. Believe it or not, our eyes, and our cameras, are only sensitive to 3 distinct colours: red, green and blue. Without us even knowing, our brains take a mix of these colours and turn them into the whole rainbow of colours that we see everyday. Equal parts red and green – our brains tell us this is yellow. Equal parts red and blue – that’s pink. But, with only 3 primary colours to mix, our ability to see small differences in colour – such as those that may be needed to tell healthy tissue from cancerous – may sometimes be inaccurate. Light, much like sound, is a wave. So imagine each colour of light as the notes on a piano. This piano has only 3 notes that can be played on just 3 keys. Red, the low-pitched note on the far left, green, in the middle, and blue, the high-pitched ring on the far right. Now imagine if we stretch the piano to normal size, adding new keys to fill out the space. Suddenly there are many more notes we can play. If we keep stretching, each time adding new keys between each original pair, the number of notes we can play continues to increase. Our lab is doing the same with light. 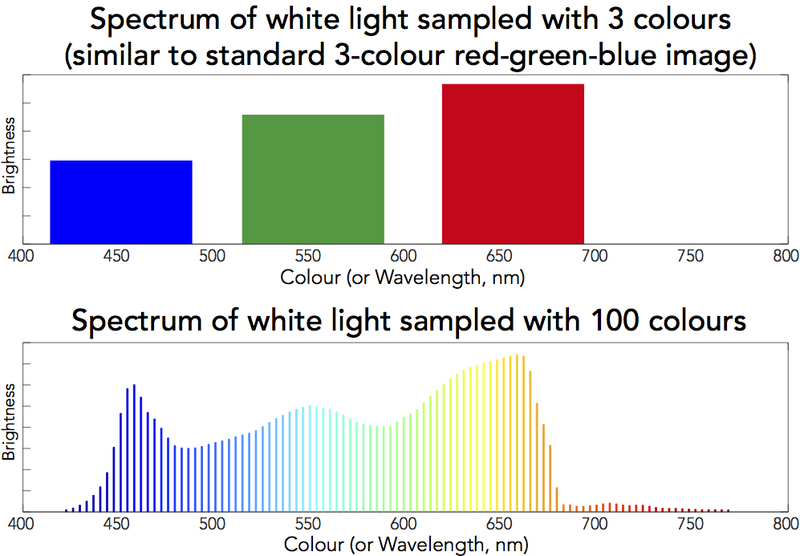 Just like the piano analogy, we can build cameras that detect more than 3 different colours. With more colours, we have more information. And with more information, things that once looked the same colour in an image on a computer screen start to look different. This is how we plan to detect those ‘invisible’ cancers. This is hyperspectral imaging. Each point of our image now has a known amount of each of many hundreds of colours. This colour information is known as a spectrum (see below). These hyperspectral cameras are better at seeing the colour of tissue and we can also combine them with new ways to light up tumours. One of the new ways that we are testing is creating chemical dyes that could highlight the cancer. In theory, these liquids could be sprayed inside the body and stick to the cancer cells due to changes that are present on a microscopic level that make the cancer cells appear different to neighbouring healthy cells. These chemicals are designed to give out light; light with a known colour, and therefore a colour that we can choose and tailor our upgraded camera to spot. But as is often the case, our lab research so far has shown that cancer is tricky. In some cases the chemical dye might not stick to a particular type of cancer. Or it might stick to some healthy tissue by mistake. Now we have hundreds of colours to play with, thanks to the upgraded camera, we can use several different dyes at the same time. Combining information from several dyes can more accurately guide us to the cancerous area. This is our goal: to use hyperspectral imaging with a combination of colour changes in diseased tissue and application of specific chemical dyes in order to more accurately detect cancers inside the body. The hyperspectral cameras that will allow us to take hyperspectral images inside the body are first being tested in tissue samples outside the body. We hope that we can test them in patients in the near future. Some early results showing the detection of 4 dyes are shown below. This image is a representation of the 72-colour hyperspectral image taken with a hyperspectral camera. The 4 coloured spots represent the fluorescence of 4 separate dyes, which would be impossible to detect simultaneously with a conventional colour camera. In our latest work, we are collaborating with doctors at Addenbrooke’s Hospital in Cambridge to try these imaging techniques in tissue samples outside of the body. Siri Luthman, the research student responsible for this work, explains a little more in the video below. One of the challenges with detecting so many colours is that each colour is now less bright. Imagine trying to catch raindrops in a bucket, just like our camera captures light. If we divide the bucket in 2 we capture fewer raindrops in each. Split it into 4, and we capture even fewer. Similarly, by capturing many colours of light with our camera, we pick up less of each colour and our images appear darker. In the next few years, advances in camera technology, and better selection of the colours that are most useful to us, will help to overcome this obstacle. With this, our long-term goal of detecting more cancers at an earlier stage is closer to becoming a reality, ensuring that more patients than ever before will have the best chance of beating their disease. This work was supported by the CRUK-EPSRC Cancer Imaging Centre in Cambridge and Manchester, the George and Lillian Schiff Foundation and the Foundation Blanceflor.